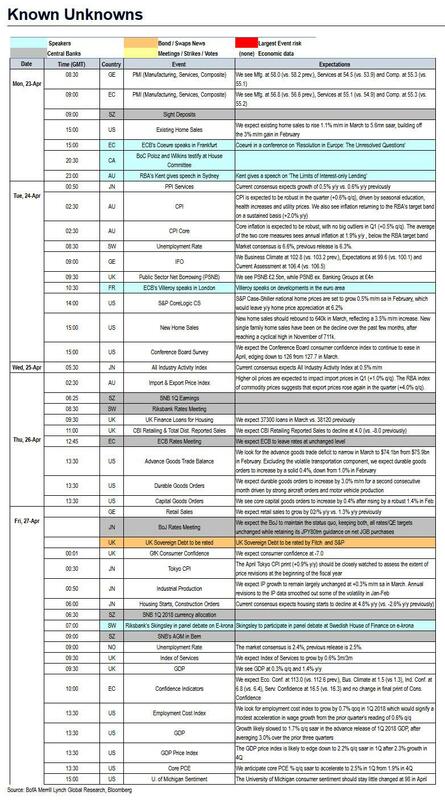 While focus this week will undoubtedly fall on earnings with 181 S&P companies set to report Q1 results, there is also a busy economic calendar on deck with US Core PCE, real GDP, UK GDP, CPI and PMI across the euro area; and CPI inflation data in Australia. Central Banks are also back in the spotlight next week with both the ECB and BoJ due to hold monetary policy meetings, although these will be mostly a formality before the strategic rendezvous in June and BoJ to maintain the status quo. In Emerging Markets, there are monetary policy meetings in Russia, Turkey, Colombia and Hungary. In geopolitics, hopes for trade dispute talks between China and the US support wider mood; signs of improvement in relations between North Korea and the US also help. An historic meeting between the leaders of South and North Korea will also likely garner plenty of attention. Meanwhile, all through it all, investors will keep watch on US 10-year Treasury yield’s ascent towards 3%. With regards to the two big central bank meetings next week, Deutsche Bank notes that for the ECB, while no change in policy is expected all eyes will be any hints or signs that officials are preparing the ground for an announcement in June that stimulus is to come to an end by the end of the year. Indeed our economists expect the ECB to announce in June that QE ends in December, with a policy hike to follow six months later. Weaker data of late and some slightly dovish ECB commentary perhaps means that risks are tilted to the downside so the market will likely be on the watch in Draghi's press conference. For the BoJ, no change in policy is also expected with core CPI this morning printing at +0.9% yoy and still short of the stable 1% inflation trend, although the market will be on the watch for the latest quarterly report which is due to be released alongside. Our economists in Japan also note that there will be two new BoJ officials taking part in the meeting for the first time, however don't expect this to have any effect on the bank's policy stance. “The European Central Bank and the Bank of Japan are a long way behind on the path to policy normalisation and are likely to reiterate the merits of a patient approach in their policy statements later in the week,” says Ian Williams at Peel Hunt. Meanwhile, the big data prints to keep an eye on are Monday's PMIs and Friday's GDP reports. In Europe, the market consensus is for a continued moderating in the April flash PMIs with the manufacturing print expected to nudge down another 0.6pts to 56.0 (which would be the lowest since February 2017) and the services a more modest 0.1pt decline to 54.8. The manufacturing PMI in the US is expected to also decline 0.6pts to 55.0. In terms of a first look at Q1 GDP in the US on Friday, the market is expecting a +2.1% annualized qoq reading while the Atlanta Fed GDP tracker is currently at +2.0%. It's worth noting that the day prior will see the release of the flash March durable and capital goods orders data which, depending on the outcome, could result in some last minute GDP forecast changes. Finally France (+0.5% qoq/+2.3% yoy) and the UK (+0.3% qoq/+1.5% yoy) will also see the first estimates of Q1 GDP on Friday. In terms of earnings next week, 181 S&P 500 companies are scheduled to report including some of the big tech heavy hitters like Google (Monday), Facebook (Wednesday), eBay (Wednesday), Twitter (Wednesday), Microsoft (Thursday), Amazon (Thursday) and Intel (Thursday). Also worth highlighting are earnings reports from Verizon, Caterpillar and Coca-Cola on Tuesday, AT&T and Boeing on Wednesday and Exxon Mobil and Chevron on Friday. Earnings season also picks up in Europe with 121 Stoxx 600 companies reporting including the likes of UBS on Monday, Credit Suisse on Wednesday and Volkswagen, Total and Royal Dutch Shell on Thursday. Last but by no means least, the big political event next week is likely to be the summit held between South Korea President Moon Jae-in and North Korea Leader Kim Jong Un in the demilitarized zone between the two countries on Friday. Away from that, French President Macron is due to travel to the US on Monday for three days and is scheduled to meet US President Trump on Tuesday. German Chancellor Merkel is also due to meet Trump on Friday. Monday: Kicking off the week on Monday will be the flash April PMIs due to be released in Japan, Europe and the US. Other data worth flagging is US existing home sales data for March. Away from that French President Macron is due to begin a three-day visit to the US, while the ECB's Coeure is scheduled to speak in the afternoon. UBS and Google are the earnings release highlights. Tuesday: The early data release highlights in Europe on Tuesday include France confidence indicators for April, the IFO survey in Germany for April and March UK public sector net borrowing data and April CBI business optimism data. 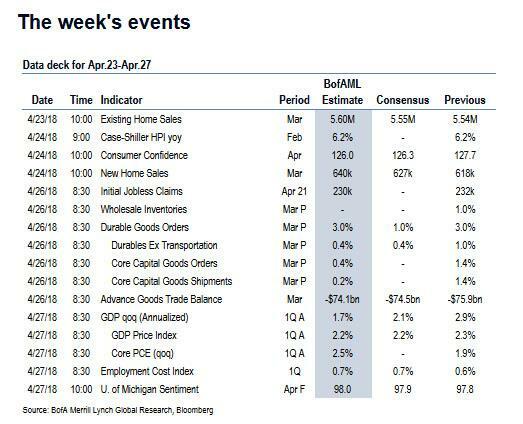 In the US the most significant release is the April consumer confidence print, while March new home sales, February S&P/Core Logic home prices and April Richmond Fed PMI are also due. Away from the data the ECB's Villeroy is due to speak in the morning, while French President Macron and US President Trump are due to meet. The main earnings highlights on Tuesday are Caterpillar, Verizon and CocaCola. Wednesday: A fairly quiet day with no significant data to highlight. The ECB's Villeroy, Knot and Lane are due to speak in the morning while the big earnings reports due out are from Credit Suisse, AT&T, Boeing, eBay, Twitter and Facebook. Thursday: The big highlight for markets on Thursday will be the ECB meeting just after midday followed by President Draghi's media briefing shortly after. Data due out includes Germany consumer confidence for May and US initial jobless claims, March advance goods trade balance and flash durable and capital goods orders data for March. Amazon, Microsoft, Royal Dutch Shell, Total, Intel and Volkswagen are notable earnings releases due out. Looking at just the US, the key economic releases this week are the employment cost index and the advance release of Q1 GDP on Friday. 10:00 AM Existing home sales, March (GS +1.0%, consensus +0.2%, last +3.0%): We look for a 1.0% increase in March existing homes sales based on regional housing data following a 3.0% rise in February. Existing home sales are an input into the brokers' commissions component of residential investment in the GDP report. 09:00 AM S&P/Case-Shiller 20-city home price index, February (GS +0.6%, consensus +0.6%, last +0.8%): We expect the S&P/Case-Shiller 20-city home price index to rise 0.6% in the February report following a 0.8% increase in the prior month. The measure still appears to be influenced by seasonal adjustment challenges, and we place more weight on the year-over-year increase, which edged up to 6.4% in January. 09:00 AM FHFA house price index, February (consensus +0.6%, last +0.8%): Consensus expects the FHFA house price index to rise 0.6% (mom sa) in February, after a 0.8% gain in January. The FHFA house price index has a wider geographic coverage than the S&P/Case-Shiller home price index, but is based only on properties financed with conforming mortgages. On a year-over-year basis, FHFA home prices rose 7.3% in January, up from 6.7% in December. 10:00 AM New home sales, March (GS flat, consensus +1.9%, last -0.6%): We expect a flat new home sales reading in March following a 0.6% decline in February. While single-family building permits and single-family starts declined in March, mortgage applications rose. 10:00 AM Conference Board consumer confidence, April (GS 126.2, consensus 126.0, last 127.7): We expect that consumer confidence index moved down 1.5pt to 126.2 in the April report, as other higher frequency measures of sentiment firmed. Despite a pull-back in March, the level of consumer confidence remained elevated relative to other sentiment measures. 08:30 AM Durable goods orders, March preliminary (GS +1.6%, consensus +1.2%, last +3.0%); Durable goods orders ex-transportation, March preliminary (GS +0.5%, consensus +0.4%, last +1.0%); Core capital goods orders, March preliminary (GS +0.3%, consensus +0.6%, last +1.4%); Core capital goods shipments, March preliminary (GS +0.2%, consensus +0.2%, last +1.4%): We expect durable goods orders rose 1.6% in March, following a 3.0% rebound in February. We believe the details of the report are likely to be firm, reflecting strong aircraft orders and following strong industrial production data for March. We expect a 0.3% increase in core capital goods orders and a 0.2% increase in core capital goods shipments. We expect durable goods orders ex-transportation to rise 0.5%. 08:30 AM Initial jobless claims, week ended April 21 (GS 230k, consensus 231k, last 232k): Continuing jobless claims, week ended April 14 (consensus 1,854k, last 1,863k): We estimate initial jobless claims edged down further by 2k to 230k in the week ending April 21. Seasonal adjustment challenges may have boosted the level of claims in recent weeks, and we note that the level of claims looks elevated in New York following a large spike in the prior week. Consensus expects a small drop in continuing claims – the number of persons receiving benefits through standard programs. 08:30 AM Employment cost index, Q1 (GS +0.8% vs. consensus +0.7%, prior +0.61%): We estimate that growth in the employment cost index (ECI) rose 0.8% in Q1 (qoq sa), with the year-over-year pace remaining stable at +2.6% (nsa). Wage growth measures generally firmed in early 2018 following softness in the fourth quarter. Our wage tracker—which distills signals from several wage measures—reaccelerated to 2.5% year-on-year in Q1 from 2.25% in Q4. We also note that benefit growth in the ECI measure slowed in Q4 and may reaccelerate. 08:30 AM GDP (advance), Q1 (GS +1.9%, consensus +2.0%, last +2.9%); Personal consumption, Q1 (GS +1.1%, consensus +1.2%, last +4.0%): We expect a +1.9% increase in the first vintage of Q1 GDP (qoq ar). We expect the composition of the report to reflect a 1.1% annualized increase in real personal consumption following a firm reading in Q4 and a boost from inventory growth (+0.6pp). We also look for a 1.8% increase in domestic final sales. 10:00 AM University of Michigan consumer sentiment, April final (GS 98.0, consensus 98.0, last 97.8): We expect the University of Michigan consumer sentiment index to edge higher to 98.0 in the final April estimate. The preliminary report’s measure of 5- to 10-year ahead inflation expectations edged down to 2.4%, after rebounding in the March final reading back to 2.5%.